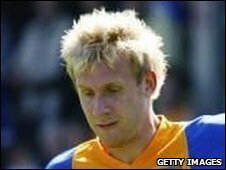 Wrexham have snapped up ex-Shrewsbury and Wales Under-21 midfielder Jamie Tolley on a month-to-month contract. "He can certainly play and is just the size of player I am looking for," said Wrexham manager Dean Saunders. The 27-year-old from Ludlow, who was released by Hereford in March, has been with the Dragons for the last month as he seeks to prove his fitness. Youngster Leon Clowes has agreed a loan deal at Airbus UK, Obi Anoruo making a similar move to Vauxhall Motors.